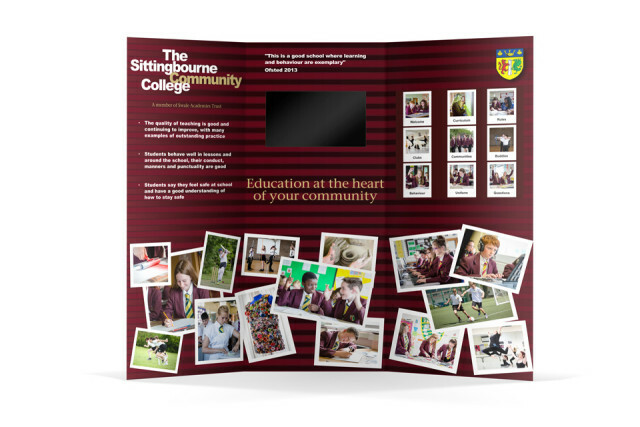 Having worked with Sittingbourne Community College for many years on their prospectus, we recently assisted with a campaign to support activities promoting the school to ‘feeder schools’. This included video, promotional materials and display graphics to aid presentation to students. 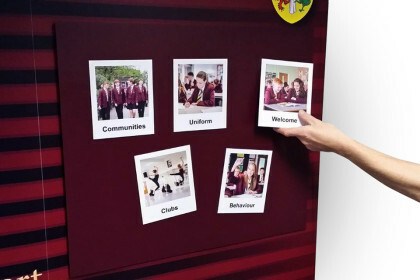 Working alongside the team responsible for delivering these presentations, we reviewed the key messages and created a bespoke display system uniquely tailored to allow further student interaction with the dialogue. 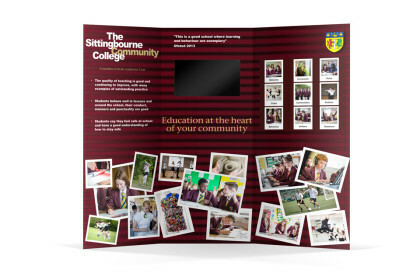 This included a customised magnetic board and moveable graphics to show students what they can expect from Sittingbourne Community College and a specific section for a built-in TV on which to show the school video. The stand mechanism was specially selected for its flexibility, customisable options and, as importantly, its ease of construction. Feedback from the client has indicated that the materials and in particular the stand, are having a positive impact on the presentations and subsequent applications.